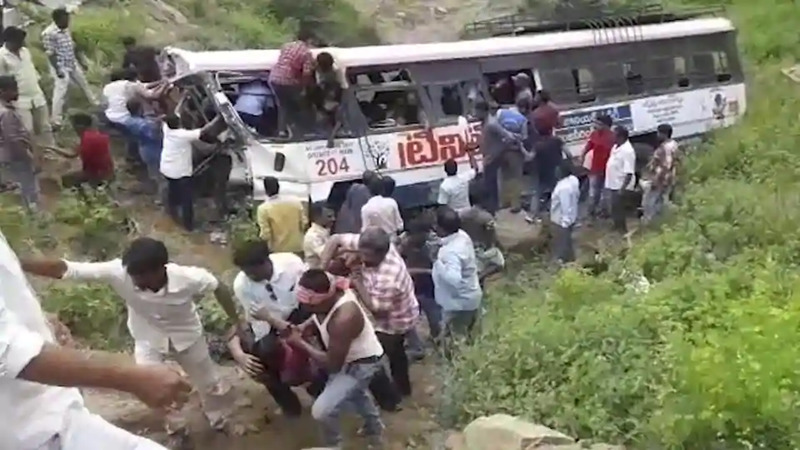 Hyderabad, Sep 11 (PTI) At least 52 passengers, most of them women, died and about 15 others were injured after an overcrowded state-run bus plunged into a valley in Telangana’s Jagtial district Tuesday, police said. The accident took place when the Telangana State Road Transport Corporation (TSRTC) bus skidded off a ghat road near Shanivarapet village, about 200 km from Hyderabad, around 11.30 am, they said. The bus was proceeding from Kondagattu to Jagtial. Telangana Caretaker Chief Minister K Chandrasekhar Rao expressed shock over the incident and announced financial assistance of Rs 5 lakh to the family of each deceased. He also asked officials to provide immediate medical assistance to the injured, a release by the Chief Minister’s Office (CMO) said. As per preliminary investigation, about 60-65 people were travelling in the bus with a capacity to accommodate only 54, police said. It is suspected that the bus driver lost control over the vehicle near a speed breaker, resulting in the accident. However, the exact reason is under investigation, she said. The officer said 31 bodies have been identified. “The bodies will be handed over to the families after postmortem,” another police official said. A TSRTC official said an inquiry was underway to ascertain the cause of the accident, adding the deceased included the driver Srinivas (51). Expressing grief over the loss of life, Telangana Pradesh Congress Committee president N Uttam Kumar Reddy demanded financial assistance of Rs 10 lakh to the families of the deceased.